It is always interesting to hear about people who win the lottery—their circumstances, what they plan to do with their winnings, etc—but the stories coming from these particular Florida Lotto winners are definitely among the most intriguing. Take Malcolm Ramsey, for example. 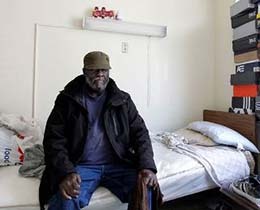 At the time he won his $500 dollars a week for life scratch off ticket, Malcolm Ramsey lived in an assisted living facility in St. Petersburg, Florida. The 55 year old man had been declared mentally incompetent and had few visitors…until they found out he had won the lottery, then they started turning up in droves, bags full of designer clothes and shoes, high end electronics and the like. But how did someone who has been deemed mentally incompetent and unable to care for themselves manage to claim his winnings without anyone being the wiser? Ramsey enlisted the help of a local cab driver who often took breaks in the parking lot of the store where Ramsey had purchased his ticket. The driver helped Ramsey get his birth certificate, which enabled him to get a valid Florida ID, then drove him to Tallahassee to claim his ticket! One incredibly lucky dog was the $3 million dollar winner when Bill Kelly, his owner, put the winning scratch off ticket into the dog's Christmas stocking. Evidently, putting lottery tickets in the Christmas stockings is a family tradition in the Kelly household and the winning ticket just happened to wind up in the family pet's stocking. 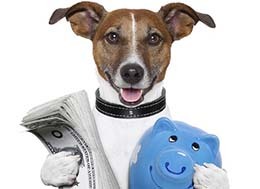 Kelly, 58, accepted the prize on the dog's behalf and accepted a lump sum amount of $2,351,433.02. That's a lot of doggy treats! Of all the fascinating lottery winners; stories, you might think that Sheelah Ryan's is the most heart warming. 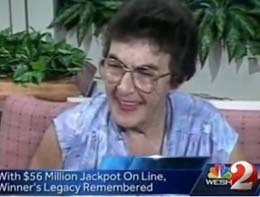 Sheelah lost her battle with cancer in 1994, but used her 1988 $55.2 million dollar Florida lottery winnings to form the Ryan Foundation. The Ryan Foundation donates to a varying assortment of charitable causes. Whether it is help for stray cats, or helping single mothers with children pay their rent to avoid eviction, or building low-cost houses, there isn't much this foundation hasn't done to make its community a better place. The Ryan Foundation has even assisted poor children in need of surgeries. What a wonderful legacy Sheelah Ryan has left with her winnings from the Florida Lottery!